NASA’s Ice, Cloud and land Elevation Satellite-2 (ICESat-2) is the latest Earth observation (EO) satellite mission to launch. It left Vandenberg Air Force Base in the United States at 13.02 GMT last Saturday. It’s a follow-on mission from ICESat, a six year operational mission that was launched on the 13th January 2003. The aim of ICESat-2 is to measure ice in the Polar Regions to help improve our understanding of how this changes over time. 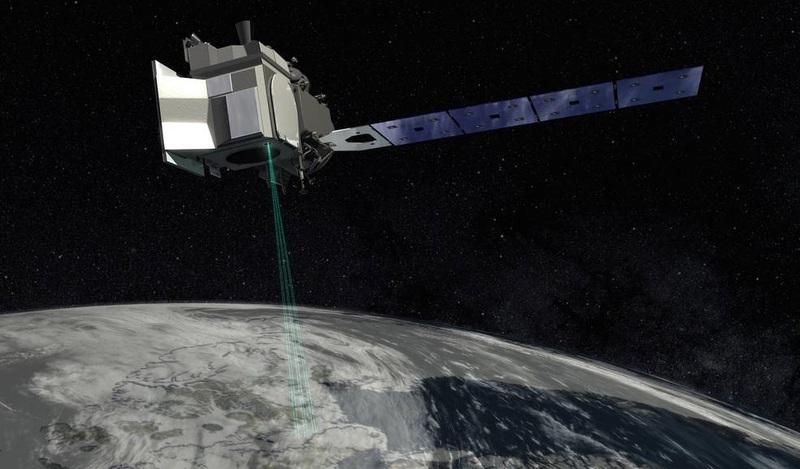 ICESat-2 only has the one instrument, the Advanced Topographic Laser Altimeter System (ATLAS). This is effectively a lidar system that will fire 10,000 visible laser pulses a second at the Earth on the 532 nm wavelength. Each pulse will contain around 20 trillion photons, but only about a dozen of these will actually return to the satellite, the rest will be deflected or absorbed by the planet or the atmosphere. The instrument will combine the time it takes for photons from multiple pulses to return to produce a highly accurate map of the cryosphere. It is hoped that it will be able to detect changes in the height of the ice-sheets to within four millimetres. Measure the height of vegetation in forests. It’s a similar principle to ESA’s CryroSAT-2 launched in 2010, which uses a Synthetic Aperture Radar (SAR)/Interferometric Radar Altimeter, known as SIRAL to send out radar pulses which cover a 250 m wide strip of the Earth to also detect millimetre changes in ice-sheets and sea-ice. Having both missions in orbit will considerably increase the data available to scientists in this field and will provide interesting comparisons between the two instruments. 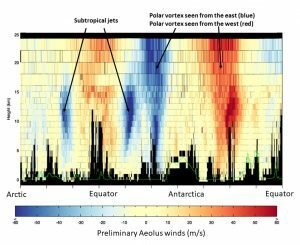 The wind part of the blog title comes from the ESA’s Aeolus satellite, which we wrote about last month, which is measuring wind profiles also using a lidar. ESA have confirmed that the satellite has already produced a preliminary set of results for three-quarters of an orbit of the Earth. Winds imaged by ESDA’s Aeolus satellite. Image courtesy of ESA/ECMWF. The image, shown on the left, has large-scale easterly and westerly winds between the surface and the lower stratosphere, including jet streams. 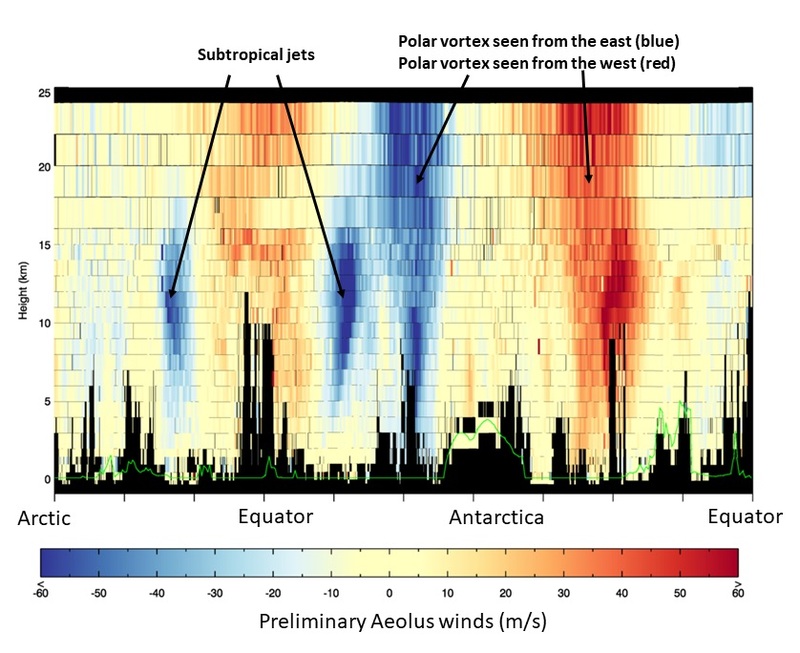 As the orbit moves from the Northern to the Southern hemisphere, Aeolus picks out subtropical westerly jets, shown in blue, either side of the equator. Moving further south it shows the winds in the troposphere and stratosphere circling the Antarctic. These first plots produced by ECWMF are exciting and it will be fascinating to see as more data becomes available how it shapes our knowledge of global wind movements. Both of these satellites are helping to add to our understanding about how different aspects of our climate operate and how they could affect other weather, climate and ecosystems. This entry was posted in CryoSat-2, Data, Earth Observation, ESA, NASA, Remote Sensing, Research, Satellite, Space Industry and tagged Advanced Topographic Laser Altimeter System, Aeolus, ATLAS, cyrosphere, Earth Observation, EO, ESA, glaciers, ice, ice sheets, ICESat, ICESat-2, Lidar, NASA, satellite, sea ice, Space, Wind by Andy. Bookmark the permalink.